People's life is a movement, wherever they are, and whoever they may be. It is an unchangeable fact that people are on a journey and not at rest. During the journey, different people see different scenery, some take action to get what they want, while some go through life standing at the excuse counter. Living a good life is really not saying. 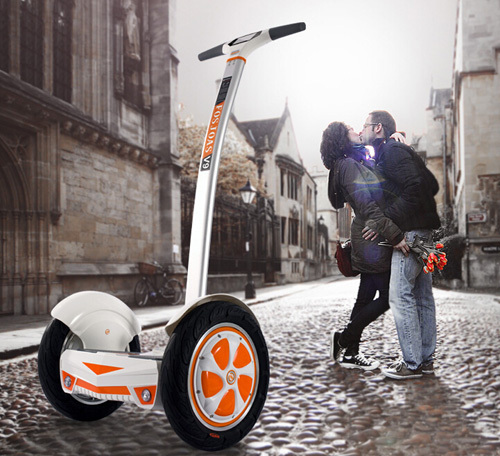 In accordance with the saying "Life lies in motion", Fosjoas two-wheeled self-balancing scooters V9 emerges to change people's ordinary living attitude. Innovation pushes the development of the society, applied technology raises the standard of lives, to ensure to keep pace, Fosjoas V9 uses intelligent chip to realize function of self-balancing, at the same time, the security of this high-tech application itself is not a problem, what's more, the smart protection system which can monitor the real-time data of the motor and turning angles so as to provide precise and comfortable maneuverability is also the masterpiece of developers. Because the journey is so long, no one will company another all the time, so people sometimes may feel lonely. With this thought, developers design built-in HD bass stereo, for music is good medicine for any emotion. Smile to the things of the past whatever it is. Accidents may pay an unexpected visit to the journey, nip in the bud is the necessary measure, besides upgraded braking system, rapid reaction time, the stoplights which make early alert to others are also making contributions. For since people were born, people have never been still for a single moment, there can be no pause until people come into port. Of course, during the journey people may meet many difficulties and challenges, which they may overcome or not, even the failure to do something is in itself a deed, so don't be afraid, just riding Fosjoas V9 two-wheel electric unicycle to embrace tomorrow.